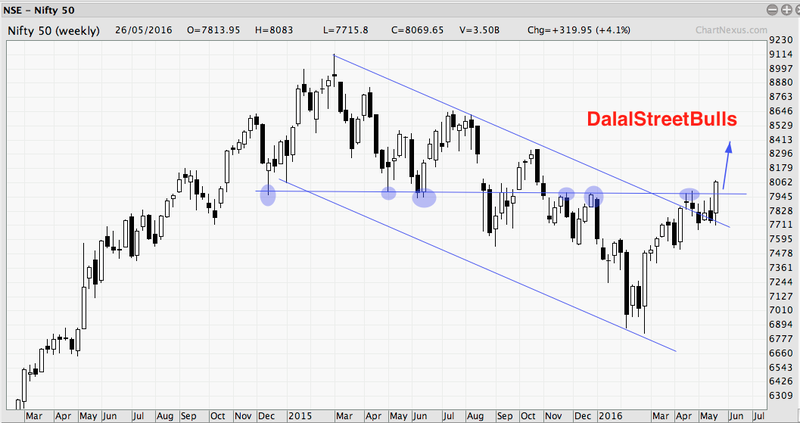 NIFTY View Nifty above 8000 - Time to sell? 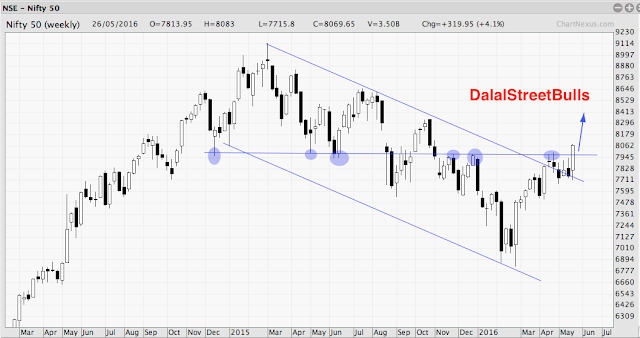 Nifty above 8000 - Time to sell? Technically Nifty looks set for an upmove after breaking out from a year long range as shown in the chart. Also, the breakout above 8,000 levels confirms strength in the index. Whats interesting to note is that IT and Pharma have under-performed in this upmove. If these sectors too start moving up, the momentum will get very strong. At the current levels, 8300-8500 also look very much possible. But what do fundamentals say? Is this rally sustainable? How to construct a portfolio at this point of time? The EPS we have available is standalone. Consolidated EPS is different, so the the PE calculated will also be a standalone PE. The EPS is calculated based on the weightage of every company in the index and their reported standalone earnings in preceding 4 quarters. We have seen 2 strong growth phases in earnings. The 2003-2007 phase and then 2010-2013 phase. We are seeing a repeat of the 2008-09 phase when earnings growth fell. The last one year, the earnings have failed to grow and are stagnant in 360-370 range. Consider this, in early 2015 they had touched a peak of 393.77! As on 27th May, 2016 it is 359.96 which shows a fall in earnings. This means negative growth rate! When the earnings are not improving, then on what basis is the market going up? Optimism. Hope that things will improve and earnings will catch up with the market. You can't trade based on PE ratio but it can be used as a barometer to estimate the medium term trend of the market. PE is the Price to Earnings ratio and is calculated by dividing the price by EPS. Nifty's historical average is 18.68 and that is considered as a fair value generally. Let's have a look at the P/E chart. At current PE levels of 22.66, Nifty valuation is expensive. If we consider a stagnant/negative growth in earnings then the valuation is VERY EXPENSIVE. We can say that the market is over-priced at this level. So will the market crash? PE is not a technical or short term forecast ratio. It says what the status is. Yes, market is overpriced and we expect valuations to cool off eventually but the market tends to stay overvalued for a long time as the wave of optimism lasts long. Nifty in the last 24 months has touched PE levels of 24 twice and we can expect the current rally to go till that valuation again. It can go till 24-26-28 and stay here for quite sometime. This means we can expect a short term rally of 30% also! And at these levels the rally is very fast. So shorting the market will be folly. When the market is showing 20% to 25% growth in earnings, we can say that a PE of 22-24 is discounting 1 year forward earnings. But when the earnings are not growing at all, then the market is hoping for a rise in earnings. Even if earnings start growing, it won't grow at 20% now itself. So the market is wildly optimistic and irrational at the moment. When the market is at such levels, people are so optimistic and scared of losing out on profits that they rule out any negatives. We have seen PE of 25+ only in the dot-com boom of 2001 and the 2007 bull market peak. Considering that there is nothing that will spark such optimism we feel that the market may head till 24-25 maximum which translates to 9000 at the most. ( PE of 25 multiplied by current EPS of 360). But does this mean that the entire market is heated? A correction in the index usually is seen with a correction in the overall market. Suppose we see that Nifty has corrected 15%, is there any sector or stock that goes up significantly in this period? Rarely and in special circumstances only. All good stocks are also beaten down which gives a great opportunity to buy them at lower levels. As you can all sectors except Energy are trading at really high valuations. However, in every market there are stocks that are fundamentally strong but have under-performed the index and are fairly valued. You have to identify them and have patience as you invest in them. When the market falls, the fall in them is lesser. How to build portfolio as these levels? The above table shows the returns from Nifty at different PE levels. We are currently in the PE range of 22-24 and investing at these levels has given a NEGATIVE return of -8.4% over 1 year and holding for 3 years you get a meagre 1.35% CAGR. 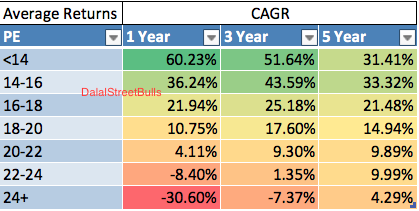 This shows that unless you invest now and hold for 5 years, you won't be getting good returns. This is applicable to equities and equity funds also. So it is better to shift money from equities to other assets. If not completely, then a very less portion of your portfolio should have exposure to equity. The BETA of your portfolio should be as close to zero as possible. WHERE EXACTLY DO I PUT MY MONEY? DalalStreetBulls clients get proper portfolio allocation guidance help apart from long term stock picks. We are soon coming out with reports on safe assets to park your funds for 6 months to 1 year when market is at HIGH ALERT zone. To know subscribe or know more about our services click here. 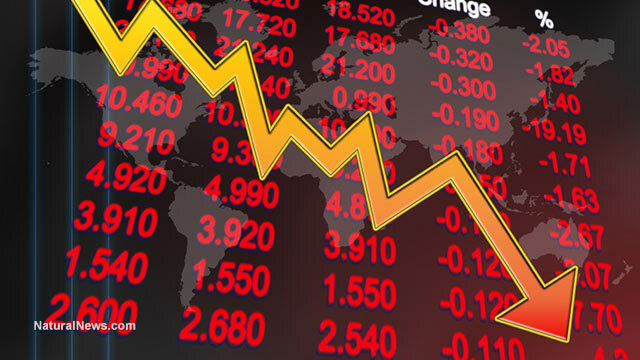 Remember: When the market is going up, a crash looks impossible and our brain is so dipped in optimism that we just can't think of 15% to 20% lower levels. But history is evidence that post high PE levels, the markets have corrected significantly. Yes Sir, VIX is at 15 levels for quite long time. Such sudden quick increase in price,when not significantly changed overnight and that too before such important global events is definitely fishy. Ofcourse I enjoy this bull run,but yes,as you said we but consider both possibilities. On upside my target is 8330 and on downside we cant rule out revisiting 8000 & 7800 plus levels. Maybe to mark 2 years of Modi Govt.? They are highlighting their achievements everywhere and they want to show Markets have gone up X% since we came to power.. Can be possible. Usually when PM goes abroad, Sensex and Nifty rally. Nifty can we sell at current level?? Won't recommend shorting at current levels seeing such a strong rally. Just talking from a fundamental perspective in this article.